HWRHS Presents: "Legally Blonde the Musical"
This weekend, the Hamilton-Wenham Regional High school proudly presents Legally Blonde the Musical. Adapted from the hit movie of the same name, the musical follows the story of Elle Woods, a Californian sorority sister from the sunny west coast beaches all the way to the hallowed halls of Harvard Law School. Join Emmett, Paulette and of course Elle’s faithful dog Bruiser as Elle searches for love and finds that being true to yourself never goes out of style. Performances are at 7PM on Friday, November 3rd as well as 2PM and 7PM on Saturday, November 4th at Hamilton-Wenham Regional High School, 775 Bay Road, S. Hamilton, MA 01982. Tickets are $15.00 for adults and $10.00 for students and seniors. They can be purchased at the door or ahead of time online through Brown Paper Tickets. From the entire cast and crew of Legally Blonde, we hope to see you there for an irreverent night of laughs, love and even a little bit of law. 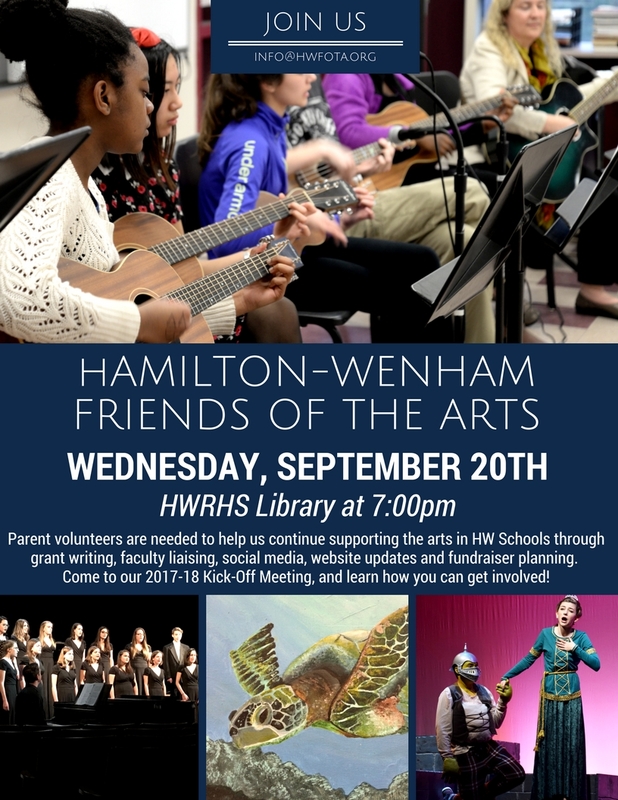 Hamilton-Wenham Friends of the Arts presents HWRHS Alumni Amanda Smerage who'll share how a high school video production class kick-started her successful, creative career. year. Taken on a whim, his video production class kick-started a career that has taken her to 4 continents, countless professional sports venues and won her 3 Emmy Awards. Most notably Amanda works for NBC covering both the NHL and The Olympic Games, and for CBS covering the NFL and PGA. Email info@hwfota.org with any questions. HW FOTA is proud to be a sponsor of the 2017 Ukulele Melee at Cutler School this Saturday June 10th starting at noon. Please come join in some musical fun. All ages and talent abilities welcome!!! $10 for Adults and $5 for Kids ages 8 - 14. Proceeds go to Ukulele Kids Club, a nonprofit organization that donates ukuleles/the gift of music to kids in nationwide children's hospitals. The weather was perfect for the over 200 runners who ran our road race yesterday. We had a record number of talented musicians lining the route, a great band entertaining the crowd and lots of wonderful volunteers helping with all the administration. Thank you to everyone who took part, sponsored us and made the day such a success. A special thanks to our kind sponsors. We are so grateful for your support! A Cappella night is May 17th at 7pm. The performers are: Manchester-Essex Sound Waves, North Reading Notorious, Dell Belles, and Kings of the Beach, and Queens of the Beach.